For more on the other domesticated subspecies, see Domestic muscovy duck. Domesticated ducks are ducks that are raised for meat, eggs and down. 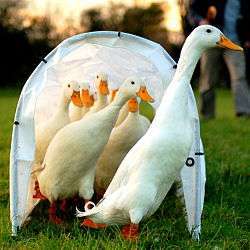 Many ducks are also kept for show, as pets, or for their ornamental value. 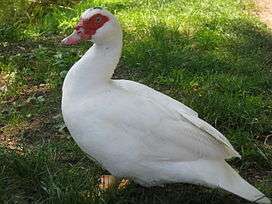 Almost all varieties of domesticated duck are descended from the mallard (Anas platyrhynchos), apart from the Muscovy duck (Cairina moschata). Ducks have been farmed for thousands of years, possibly starting in Southeast Asia. In the Western world, they are not as popular as the chicken, because chickens have much more white lean meat and are easier to keep confined, making the total price much lower for chicken meat, whereas duck is comparatively expensive. While popular in haute cuisine, duck appears less frequently in the mass-market food industry and restaurants in the lower price range. However, ducks are more popular in China and there they are raised extensively. Ducks are farmed for their meat, eggs, and down. A minority of ducks are also kept for foie gras production. In Vietnam, their blood is used in a food called tiết canh. Their eggs are blue-green to white, depending on the breed. Ducks can be kept free range, in cages, in barns, or in batteries. Ducks enjoy access to swimming water, but do not require it to survive. They should be fed a grain and insect diet. It is a popular misconception that ducks should be fed bread; bread has limited nutritional value and can be deadly when fed to developing ducklings. Ducks should be monitored for avian influenza, as they are especially prone to infection with the dangerous H5N1 strain. The females of many breeds of domestic ducks are unreliable at sitting their eggs and raising their young. Notable exceptions include the Rouen duck and especially the Muscovy duck. It has been a custom on farms for centuries to put duck eggs under broody hens for hatching; nowadays incubators are often used. However, young ducklings rely on their mothers for a supply of preen oil to make them waterproof; a chicken hen does not make as much preen oil as a female duck, and an incubator makes none. Once the duckling grows its own feathers, it will produce preen oil from the sebaceous gland near the base of its tail. 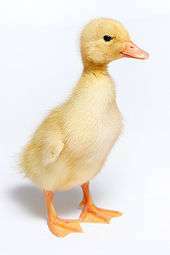 Domesticated ducks can be kept as pets, in a garden or backyard, and with special accessories, have also been known to be kept in the house. They will often eat insects and slugs. A pond or deep water dish is recommended. If they are given access to a pond, they will dabble in the mud, dredging out and eating wildlife and frog spawn, and swallow adult frogs and toads up to the size of the British common frog Rana temporaria, as they have been bred to be much bigger than wild ducks, with a "hull length" (base of neck to base of tail) of up to 1 foot (30 cm) or more; the wild mallard's "hull length" is about 6 inches (15 cm). A coop should be provided for shelter from predators such as foxes, hawks, coyotes, and raccoons, as many breeds of domestic ducks cannot fly. Ducks are also kept for their ornamental value. Breeds have been developed with crests and tufts or striking plumage. Exhibition shows are held in which ducks, along with other breeds of poultry, are exhibited in competition. These shows can be "open" (meaning any exhibitor who pays the required entry fee can enter), or "closed" (accessible only to members of a given group). ↑ "Anas platyrhynchos, Domestic Duck; DigiMorph Staff - The University of Texas at Austin". Digimorph.org. Retrieved 23 December 2012. ↑ Sy Montgomery. "Mallard; Encyclopædia Britannica". Britannica.com. Retrieved 23 December 2012. ↑ Kiple, Kenneth F.; Ornelas, Kriemhild Coneè (2000). The Cambridge World History of Food. Cambridge, UK: Cambridge University Press. ISBN 0-521-40214-X. OCLC 44541840. Wikimedia Commons has media related to Domesticated ducks.